Never Stop Sneakin’ is a for now Nintendo Switch exclusive top-down stealth game, where you traverse a single dungeon to find objectives and make money. Why do you need to make money? Well, you need to build a time machine to be able to rescue the presidents kidnapped by the evil Amadeus Guildenstern. A big thanks to the developer of the game, who has kindly provided us with a review copy for this title. The premise of the game is simple; you only use a single button to play the game. Actually, button is the wrong term here as you only use the thumbstick to move the character and that’s it. How do you perform attacks then? Well, whenever you are close enough to the enemy, you automatically take them out. 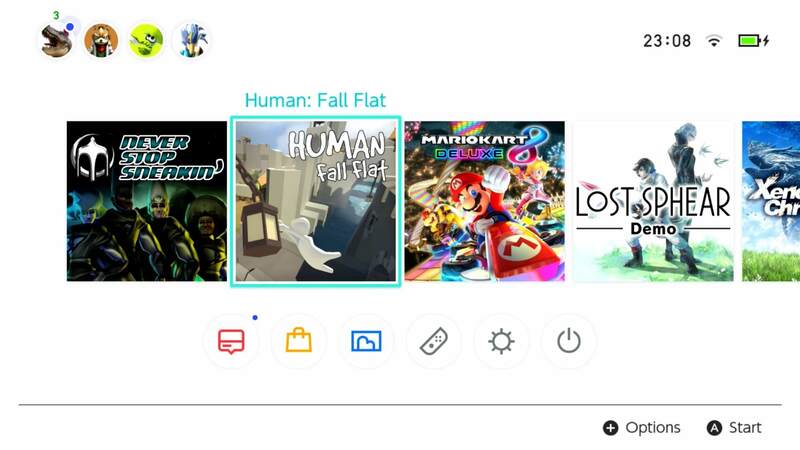 This system works surprisingly well and I personally really enjoy games that create a unique premise and try to make the most out of it. But more on that later, let’s talk about the story and the graphics of the game first. The story goes as follows. All of the presidents of the United States have been kidnapped. And by all of them, we really mean all of them. How did that happen though? 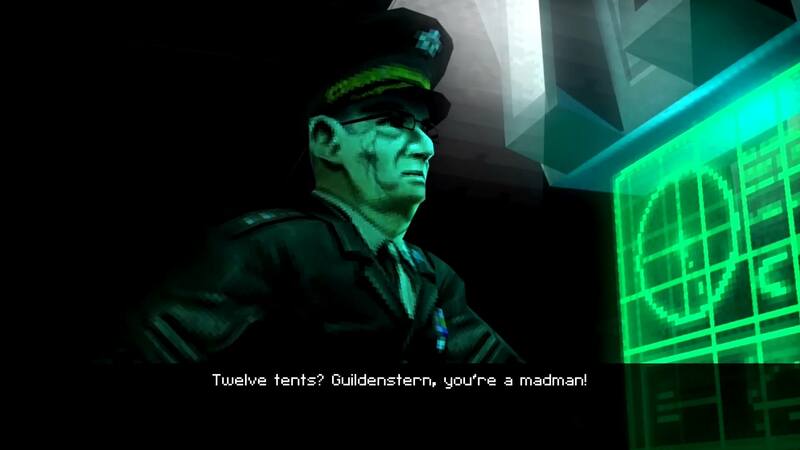 Quite simply, the villain of the story Amadeus Guildenstern has created a time machine, with which he was able to accomplish this task. 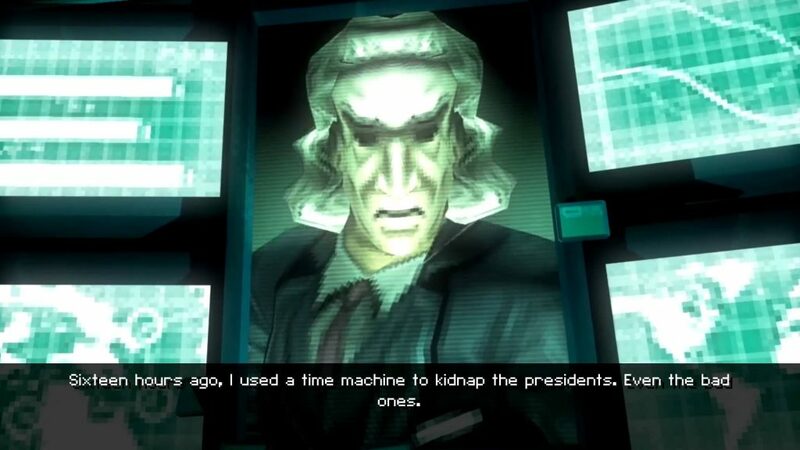 Now it is up to you along with the General of the Sneakin Department to save the presidents by building your own time machine. That was the premise and if you have yet to notice, the game is very serious in its tone and story. Just kidding, the game takes itself extremely lightly. Pretty much every single written line in this game is a joke, even your adversaries are references, come on Vice President Helicopter? Actually, that would be pretty cool. Nevertheless, if you like these kinds of tongue in cheek jokes and references, you are in for a treat here and the story alone might give you enough reason to play this game. Of course, if you prefer serious games instead, this game might be unsuited for you. The story of the game is mainly told in intermissive cutscenes, which are usually as light-hearted as the rest of the game. While they are fully voiced, they lack lip-sync, but they end up looking pretty good regardless as the animations can be described by anything other than stiff. Let’s move over to the Graphics and Atmosphere of the game now. When talking about graphics of Nintendo Switch Games, the most important aspect to talk about is the game’s icon. Here it is. Personally I think it’s ok; it could be prettier but it follows Nintendo’s iconography guidelines, which means it’s able to serve its purpose. Moving on, the graphics look like something from the Pre-GameCube or Playstation 2 era. Avoid taking this the bad way though, as it is purely an artistic choice. The graphics are overall very clear, but one can also very distinctly see the pixelated textures. However, they are applied in such a way that they end up looking pretty nice. While every single object in the game has very little detail by itself, the combination of them makes the entire scene look detailed. Especially the ground structure is very impressive, given that the environment is randomly generated. Overall, while playing, the textures blend in with each other creating tidy, clean and crisp environments. 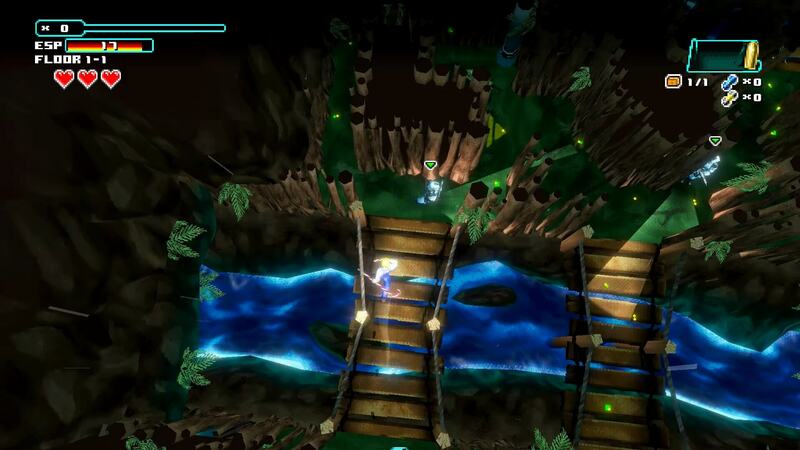 Following up with the graphics is the game’s atmosphere. Let’s take a look at one of the environments here in the game and dissect it. On first glance, you may only see very little. However, taking a deeper look you will be able to notice all the detail here. 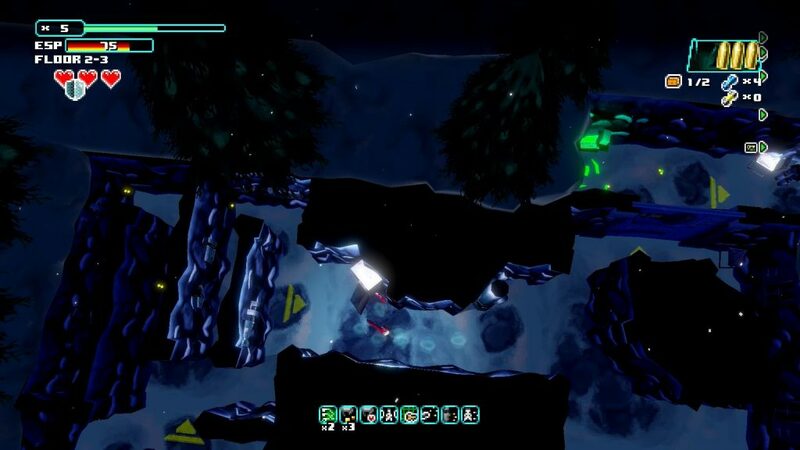 The trees move, the snow falls and especially the game’s lighting engine is impressive. Moving your character around you will see how the shadows move around him in a very definitive way. While you are unable to see this from the standing images I’ve provided you with so far, I will be making a video review of the title very shortly, so you can better see what I mean. This is precisely what makes a game look good. While you might be unaware of this in normal gameplay, you would feel there’s something missing and you probably would also be unable to put your head onto what exactly it is. This kind of lighting is what great developers pay a lot of attention to when designing the game and it is evident that this game is made by such. Considering the dungeons are all randomly generated, a lot of time must have gone into optimizing it to make the environments look as good as this. To note here, there is a good variety in them as well, spanning from futuristic bases to jungle hideouts. On another note, the game’s sound effects and music are also very important for the atmosphere to say the least. Rest assured, those are implemented very well here. Slicing an enemy was always so satisfying, probably because of the great sound effect accompanying it. Additionally, the music is absolutely fantastic! Just check out YouTube for that! Taking all this information on the atmosphere in, it is very clear that the game had a lot of love and effort being poured into it. It is highly polished, and this polish makes it a benchmark in what all games, whether indie or Triple-A, should strive to have. Now let’s get into the gameplay and take a look at what this title has to offer to us. As mentioned earlier, the gameplay has the following premise; you sneak around a randomly-generated dungeon using only your thumbstick without pressing a single button. This caught me by surprise, but in a positive way. This is a limitation, which can be a very good thing as it forces the developer to design creative gameplay elements that could then go on to create a very unique experience for the player. If the developer achieves that, he will have a unique hit on his hands. However, if he fails at that, the game runs the risk of being stale with very little mechanics to back it up. Let’s see in what category Never Stop Sneakin’ falls in. About to get a drop on an enemy goon. The title starts you off with a tutorial. First, you learn how to attack and avoid enemies. This is simple as by just being close to them, you can kill them. However, if they spot you, as indicated by the light cone in front of them, they will shoot at you. Don’t give up hope yet as you still have some defenses available. If you have managed to pick up a bullet, you will instead automatically shoot down the enemy. 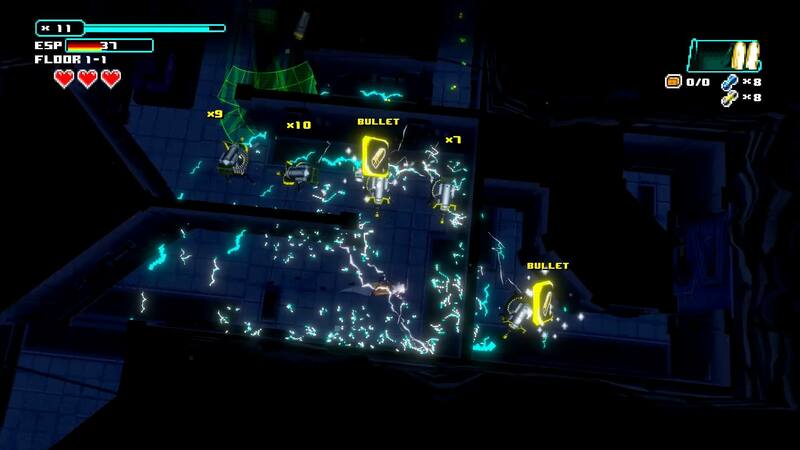 If you lack bullets, you might still have a smokescreen on hand, which will stun all surrounding enemies. Now, out of bullets and out of smokescreens, you’ve become vulnerable to their attacks and will therefore have to be extra careful to avoid any further damage. This actually makes for a great system, as a single mistake is never a big deal. Multiple mistakes in a row however will cost you your collected equipment and maybe even your life. Therefore, you are always allowed to be a bit more risky if you’ve recently found a bunch of stuff, but will need to be more careful if you’ve just used it up. This makes for a good system and a nice alternation between possible playstyles. You walk into the turret’s line of sight …. 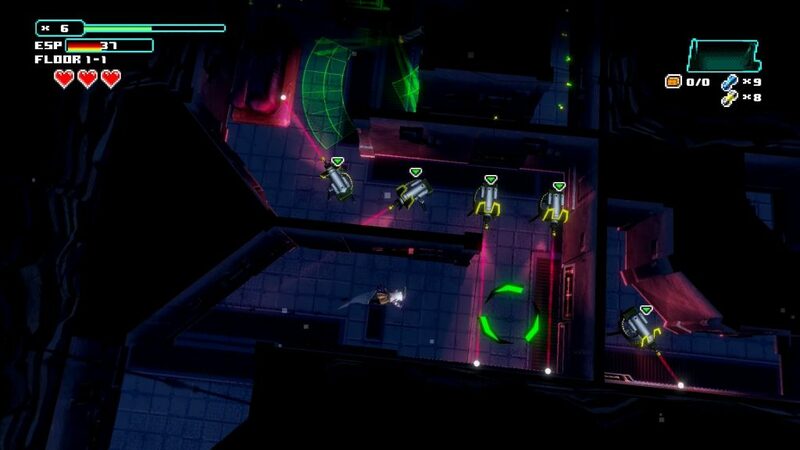 … and an EMP is automatically activating disabling all turrets in the area. As long as you have an EMP left over of course. Another very positive aspect about the enemies is that they always move in fairly predictable ways and avoid being sudden or sporadic. Thus, whenever you mess up it is definitely your fault, but you also feel very satisfied when you are able to outsmart the movement of an enemy and get a drop on them. For example, turrets always turn in clockwise motion making a stop after 90 Degrees. This means, you should always be able to anticipate where it goes next. It was further very enjoyable when I was able to kill multiple enemies in succession, either by just moving at them or “accidentally” dropping an EMP or smokescreen. To find bullets and smokescreens you need to hack into files, computers and other things lying around the enemy base that you’ve sneaked in. There are also EMPs, which are used to counter cameras and turrets. So, the game is therefore played by avoiding the enemies’ line of sight and to collect as much money, or in other terms ESP, as possible. You earn ESP by killing enemies, picking it up from the floor or opening up containers in the base. Killing foes in succession will also grant you a multiplier to the amount of ESP you receive, so there’s an incentive to exterminate many of them at once. All that ESP will go to a good purpose outside of sneaking. Here, you construct a series of buildings with the money you’ve earned to achieve your end goal of constructing a time machine. 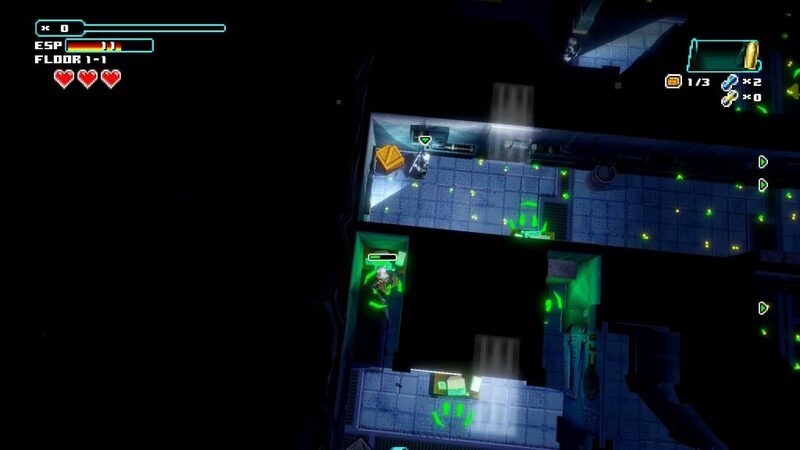 Sometimes however, you need a specialist or a certain object to continue constructing, which means that you have to rescue them from the enemies’ base. This along with the required ESP for construction will keep you going back into the enemy territory again and again and again. While this felt quite engaging for about 2 to 3 hours, things started to become very homogenous after that. 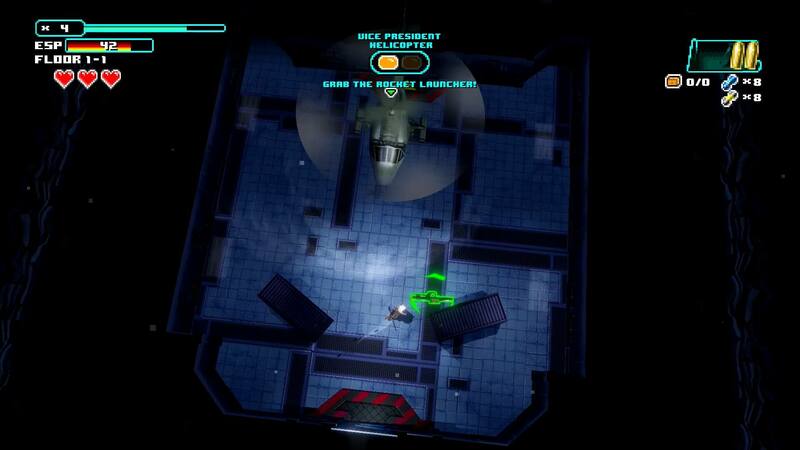 It turns out, that the only standard enemies in the game are the soldiers, the cameras and the turrets. This was a big shame as you encounter all of them within 10 minutes of playing the game. Considering the game took me around 12 hours to beat, this is really bad. In the end, you will fight every single enemy countless amounts of time and the same goes for the bosses. There are 5 or so bosses in the game and while they are very creative themselves, it becomes rather annoying to fight the same boss for the twentieth time. Yes, you really do fight them that often, probably even more than that. I have unfortunately lost count. The gameplay loop ends up being that you either need to collect more ESP to construct a building or a special character or item that you need to find to be able to do so in the first place. This kinda makes this mechanic pointless, as constructing the buildings is just a checklist that supplies the player with an excuse to go back into the enemies’ base. Even finding the kidnapped character or item is the same each time. All you do is reach the floor where the person or item is being held, find and kill the enemy that holds the keycard and then walk up to the person or item. That’s it and this every single time. This lack of varied gameplay really is the game’s unfortunate downfall. This is what the base building looks like. 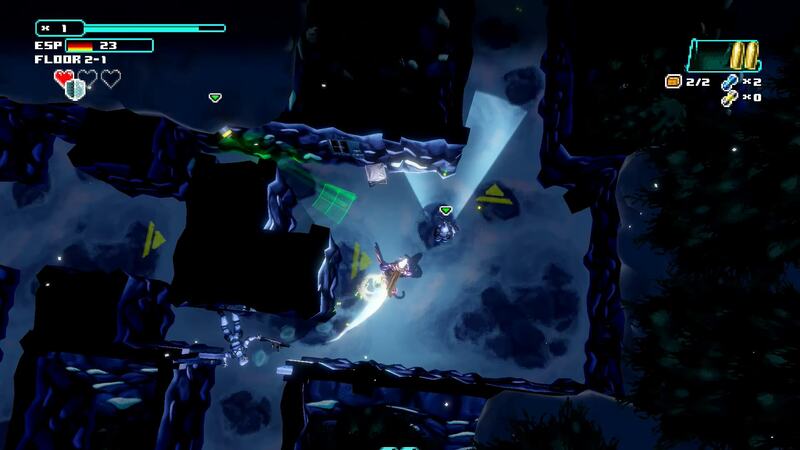 The game’s level structure is a single dungeon that you enter again and again and can traverse until the end. This dungeon is made up of multiple levels with 3 floors each. At the end of each level, you get to do a bossfight. 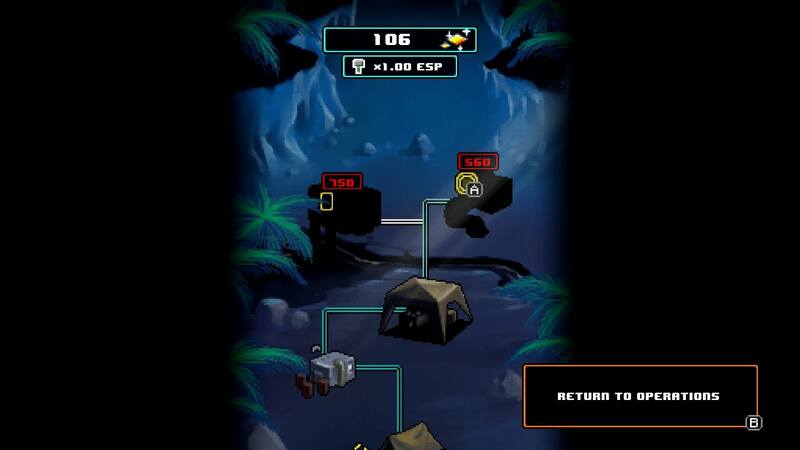 At first, only 1 level is available to you, but as you progress through the game you are able to reach deeper and deeper into the dungeon and gain access to more levels. Unfortunately, levels barely differ from one another with the type of environment also always being randomly chosen. Here would have been a good opportunity to develop and include new gameplay elements into the game. There should’ve been at least one new element in each level to really keep the gameplay engaging and exciting. You could probably think of some very funny campaign slogans if your running mate is a helicopter. One thing that could be considered new gameplay elements are perks that you unlock as you go along with the game. However, rather than introducing changes to the gameplay they really just make the game easier. While they do add a little spice to the way you experience the game, they are far from enough to give the gameplay satisfactory variety. 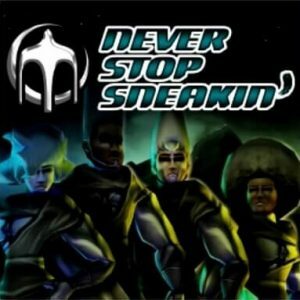 In defense of Never Stop Sneakin’ however, the game first of all does what it’s called as in that you never actually stop sneaking around. Secondly, the base gameplay is good and very enjoyable. The lack of variety is what hurts it rather than what it has to offer. I definitely felt this, as I was having a lot more fun if I took breaks from playing the game and coming back to it later. It would therefore be recommendable to play this game inbetween other sections or something that you play on a reasonable short public transit ride to and from home. Now, before we head into the conclusion, let’s take a look at the performance on the Nintendo Switch. As mentioned earlier in the graphics section, the game is higly polished and that extends to the performance of the game as well. The game runs at a solid 60fps with a resolution of 720p undocked and 1080p docked. There are a few minor dips in busy sections with lots of particles around, but that never ended up distracting the game much at all. What is especially great about this version though is that it actually utilizes the features of the console. It was nice getting small bits of feedback on collecting ESP or when killing enemies through the HD Rumble of the game. While I am unable to confirm positional effects on it, since I am rather insensitive to it, the different intensities it operated at were definitely nice. The one thing I found really great though is that the game makes use of the device’s touchscreen. Although the implementation felt rather inaccurate during gameplay, it was definitely great that the option is there. What I definitely appreciate though is menu navigation with the touchscreen. Many games on the device neglect that feature, which surprises me as menus are much more intuitively operated by a touchscreen. This is nice to have and definitely shows the care and effort the developer Dean Dodrill has put into the game. Just one example of the game’s sense of humour. Here at Red Value Gaming, we give games two ratings; one for the price and one traditional score that you know and love just like everywhere else. With this system, we rate the game’s price, its business practices and a few other factors like its polish, performance, length and repetiveness in the value rating. We believe that these categories oftentimes leave the general quality of the game unaffected but are still important, which is why we evaluate these with the value rating. This allows us to focus our review score solely on the intrinsic quality of the game. In conclusion, I believe the the value of the game to be $10 and looking at our review guidelines, I rate the game at a 68 out of 100. While the game is around 12 hours long, giving you a good Dollar per hour value with the base price of $14.99, those hours are quite repetitive and end up hurting the value instead. In my eyes it would have been much better if the game had been shorter but more tightly packed. Since it is the main gameplay that is repetitive, it affects the score as well as the quality of the game therefore suffers. The game’s saving grace is its high degree of polish and atmosphere as well as the very funny but silly writing that will definitely be appealing to some. These bumped both the score and value up a bit. The gameplay at its core is actually really great and it is a bit of a shame that the lack of variety hurts it. In my opinion, a patch that introduces more gameplay mechanics, especially more enemies, at higher levels could really remedy this situation and give the title a huge buff in both its value and its score. If the title does look interesting to you, you might want to pick it up if you enjoy light low-stress stealth gameplay along with goofy humour and are looking to play the game in situations where you pick it up every now and then for around 20 to 30 minutes at a time. Definitely though, thank you so much for reading this article. As a writer, it always feels great if someone else reads your stuff, which is why I appreciate every single click. If you liked this review, consider subscribing to Red Value Gaming on YouTube, Facebook or Twitter. It would really help this site out. By the way, Red Value Gaming is all about the value of games and allows you to vote on how much a game is worth to you along with being able to write your own reviews for it. Kinda like Metacritic, but with price! Don’t mind the Star Wars Battlefront II page though, 9Gag has already managed to invade it! While the base gameplay of the title is solid and great, the lack of variety really hurts it. This is especially upsetting as the game is highly polished in virtually every single aspect. With a few improvements, the game could really be something very unique and special. Since the base gameplay is solid, you might find to enjoy it if you play it for shorter section. Are you entertained by goofy humour and are looking for something low-stress to play inbetween sessions? You might find this title to be quite interesting.